As mentioned previously, one of the aims for this project was to compare allele frequencies between life stages of the Olympia oyster to see if there are any significant shifts and at which loci. These shifts could be due to stochastic processes, such as Sweepstakes Reproductive Success, or strong selection during a life stage that causes high mortality for individuals with certain alleles. Discriminating between the two is veryyyy difficult. As this field season is exploratory, I designed an experiment to determine if allele frequencies might indeed be shifting between life stages and whether this varies by geographic location and environmental conditions. Larval Olympia oysters preferentially settle on oyster shells, so I made sticks with shells on them to place in various locations at the beginning of my field season. Olys (the affectionate term for Olympia oysters) start spawning as early as mid June and can go until September. After settling, the spat is about 0.5mm in size and under the microscope faintly resembles a contact lens. At the end of my field season I planned to gather some of the oyster sticks and carefully scrape off the spat for subsequent genetic analysis. 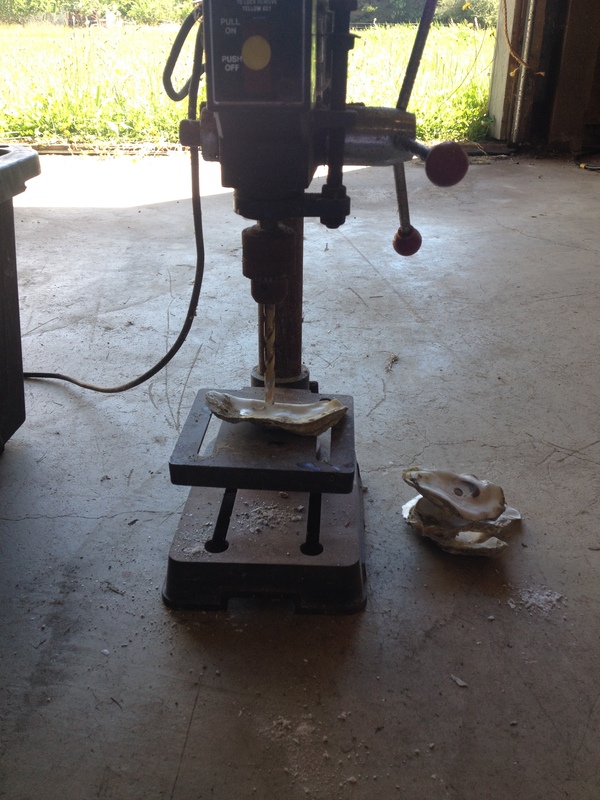 The remaining oyster sticks would be left to allow the spat to mature to juveniles and then sampled at a later date. Shell sticks after being left in the water for almost a year. Due to Jennifer Ruesink’s longterm monitoring of larval settlement in the area and recent characterization of pH variability, I chose Willapa Bay as one of the geographic regions for this project. The pH in the southeast part of the bay remains relatively stable at 8 during the summer, while the pH in the north part of the bay can range between 7.6 to 8.6 (a huge difference when you consider the pH scale only goes to 14!!). 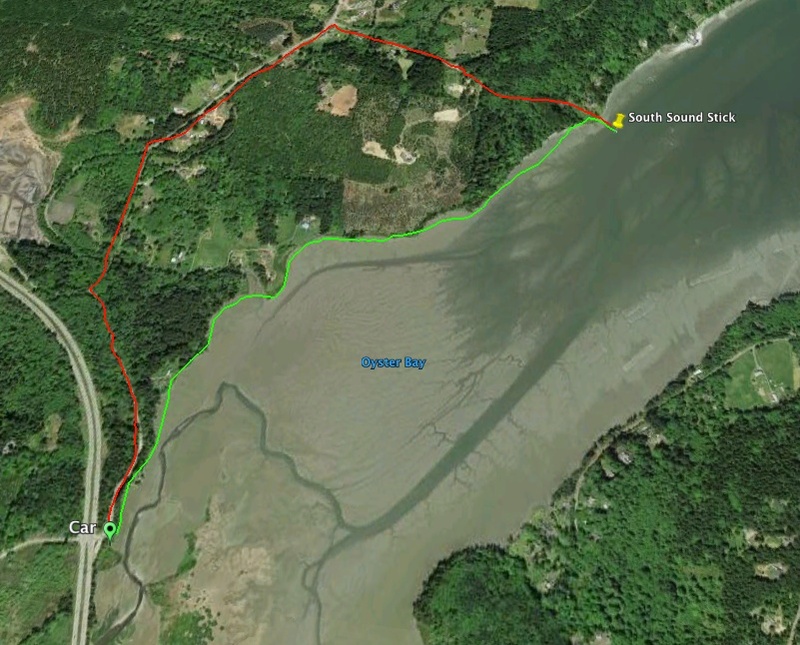 This difference in variability between the sites is likely due to the Willapa River input in the north and other oceanographic features of the bay. To see if these environmental differences affect allele frequency shifts, I decided to place shell substrates in both areas. While setting out oyster sticks in the southeast was easy, the olys in the north part tend to settle on substrate 30 feet underwater. To address this, Alan (introduced here) helped me construct the concrete version of shell sticks, because apparently oly larvae are not very discriminating between shell and cinder blocks. The blocks were tied to buoys and then deployed at a later date by Alan to be picked up again sometime in October. The other region I chose was Puget Sound, WA, which also demonstrates environmental heterogeneity between different subregions. Dr. Brent Vadopolas and others at the University of Washington are doing some really interesting work looking for signals of local adaptation in 3 populations of Olympia oysters by outplanting oysters from each population to 4 locations around Puget Sound. During the course of this study, they observed extreme mortality in one location (Dabob Bay) for all transplanted populations. Additional observations from the region indicate that natural populations of olys in south Puget Sound are doing well, while those in the north are starting to grow despite previously low numbers. Some questions these observations raise: was the mortality event stochastic, or was it due to consistent ecological factors in the area? If oysters are locally adapted to their specific subregion of Puget Sound, where at the northern oysters recruiting from? 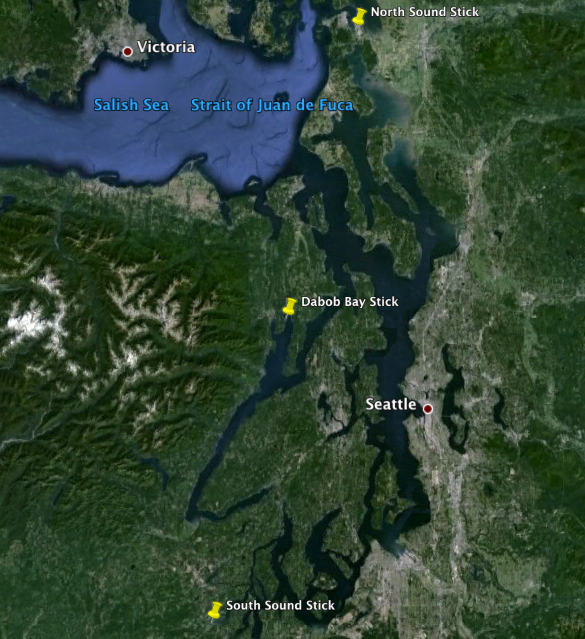 To tie in my project with theirs, I placed two shell sticks next to their experiment in the North Sound and two near the South Sound location. Stephanie Valdez, a recent graduate of UW, is monitoring Olympia and Pacific oyster settlement in Hood Canal (body of water that offshoots Puget Sound) and agreed to give me the oly recruits from her Dabob Bay shell sticks for genetic analysis. Sounds like a great plan, right? 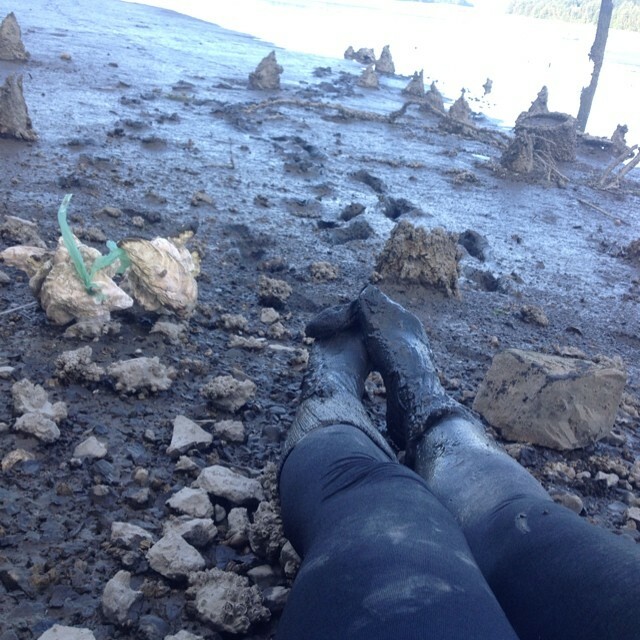 As I’m writing this post facto, I can say that this aspect of my field season was essentially a failure from the get go, at least with the Puget Sound shell sticks. First, I was unable to find the oyster transplant site in South Sound due to a miscommunication about the GPS coordinates and my own stubbornness about asking for clarification. Instead, I decided to find my own spot in the vicinity to put my shell sticks. The area of the sound I was in, Oyster Bay, is surrounded by private homes with “No Trespassing” signs and actual commercial oyster farms. After an unsuccessful attempt to ask a homeowner for permission to access the bay from their backyard, I gave up on that idea and decided to park at a wildlife viewing area near the tip of the estuary and cross the (deceptively) short distance to the water’s edge. It took an hour of slogging through the mud, losing my boots, being laughed at by raccoons, and eventually breaking one of my shell sticks for me to accept defeat. That night, after a campground shower and a couple IPAs, I found the resolve to try again the next day. This time, instead of directly cutting across the soul-crushing mud to the water, I decided to walk along the rocky edge of the bay until I reached an area that would remain underwater even during minus tides. This Google Earth image was obviously taken during a normal tide, because when I trekked out there with a 1.3 ft low tide the water didn’t reach nearly as far inland. From the car to the shell stick placement site was about 1.2 miles of sweating, slipping, cursing, and overall misery. To avoid such a return trek, I cut through someone’s backyard and walked 2 miles on the backroads- no doubt looking like the creature from the black lagoon. The placement in North Puget Sound was considerably easier. I quickly found the UW oyster transplant site and wedged my shell sticks about 50 ft away. Fast forward 5 weeks to the beginning of August. By that time, I had finally internalized the value of asking for help and simply drove up to the house in Oyster Bay I had previously trespassed by and asked if I could walk through their backyard to the bay. They found the request strange, but mildly amusing and let me go by. When I get to the coordinates for my shell sticks, however, they were gone. Both of them. I frantically waded around the entire area to no avail. Talking to Stephanie later, she said that in her work shell sticks do occasionally go missing. Maybe a nearby oyster farmer saw the pink flag tape sticking out of the water and thought it was trash. Maybe I didn’t hammer them in deep enough and they washed out with the tides. Maybe otters came and made a shell necklace out of them. Whatever the cause, by not having one of the sites it took away any interesting comparisons I could do with the others in the region so I decided to focus on my phylogeographic collections for the remainder of my field season. Also, I still have hope to get something interesting out of the recruits I’ve collected from Willapa Bay. While totally a bummer, the entire experience taught me a lot about field work, experimental design, and myself. When setting out an experiment, talk to all of the nearby landowners and workers so they know to keep an eye out and not disturb anything. They may even be interested in the science! Don’t put all of your eggs in one basket, i.e. 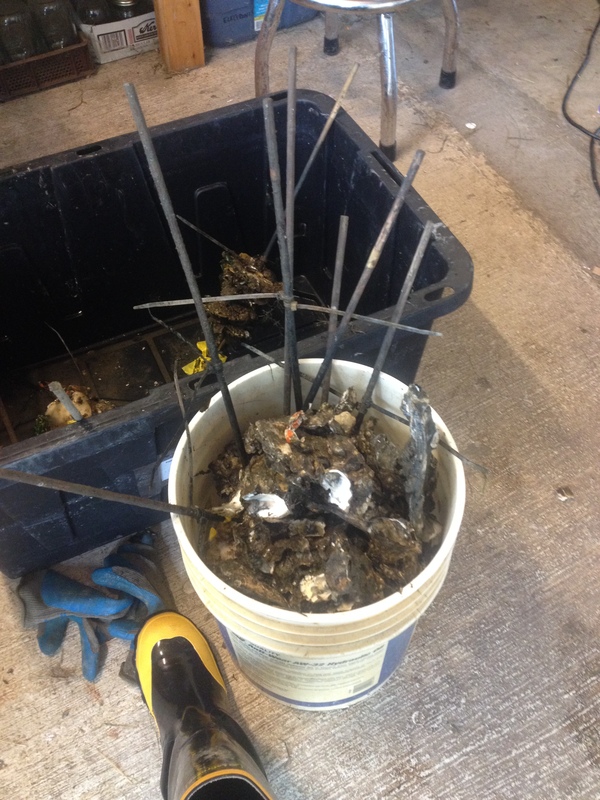 put your shell sticks in multiple sites for a sampling area. Ask for help! You don’t get any points for being stubborn and trying to work something out alone. In fact, you’re more likely to get covered in mud. This entry was posted in Blog, Summer 2014 by ksil91. Bookmark the permalink.